The Global Alliance for Trade Facilitation’s (the Alliance) project to introduce advance rulings for Colombia’s automotive industry has been recommended as best practice in a report by the Americas Business Dialogue (ABD). 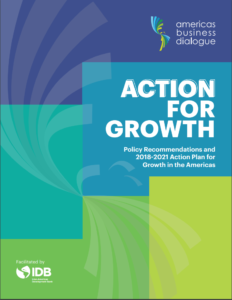 The report, Action for Growth, states that the value of what is made in the Americas can be improved if trade across borders is more efficient and less expensive, and argues that streamlining and expediting customs procedures should be a core part of governments’ efforts to unlock sustainable economic growth. It cites a recent study carried out by the Organisation for Economic Co-operation and Development that found that advance ruling systems can reduce trade costs by an estimated 5.4%. Among its 42 recommendations to heads of state throughout the Americas, it advises governments to increase the use of advance rulings and points to the Alliance’s project as an example of how this can be done through public-private partnerships. The report also points out that while the Alliance’s project focuses on the automotive industry, it can be replicated across the region in different sectors, boosting regional trade and unlocking economic growth. The Alliance is a not-for-profit venture which brings together governments and businesses as equal partners to identify trade facilitation issues, such as customs delays and unnecessary red tape at borders, and implement targeted reforms to address them. It was set up to help governments implement the World Trade Organization’s Trade Facilitation Agreement (TFA) and to ultimately encourage sustainable development and poverty reduction. The Americas Business Dialogue, a private sector-driven initiative facilitated by the Inter-American Development Bank, aims to foster high level policy dialogue among business and government leaders on the economic and social development of the Americas. Like the Alliance, it champions the role of public-private partnerships in delivering sustainable growth. The Alliance’s project highlighted in ABD’s report sees it supporting Colombia’s customs agency, DIAN, to set up a Centre for Trade Facilitation and Good Practices. The centre will be run by customs, have a dedicated team with specialised knowledge and understanding of the automotive industry and its needs, and will issue advance rulings to clarify the classification, valuation and origin of goods prior to their importation or exportation, cutting clearance times at borders. Speaking at the VIII Summit of the Americas in Lima, Peru, last month, where the report was presented to heads of state, US Secretary of Commerce Wilbur Ross, highlighted the potential of implementing the TFA to unlock growth in the region. He pointed out that there is a significant opportunity to boost trade within the region as currently only 15% of exports go to other Latin American countries.